Maravilhe-se com os monumentos e memoriais de Canberra nesta excursão de um dia saindo de Sydney. Observe a capital australiana do monte Ainslie; caminhe pelos corredores históricos da Parliament House e visite o comovente Australian War Memorial. 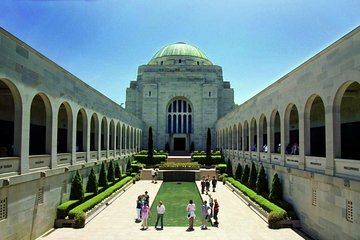 Depois, aproveite uma visita independente do Museu Nacional da Austrália ou da National Gallery; aprenda mais sobre a história fasincentiva de Canberra em Yarralumla; e admire os belos parques e lagos da cidade. The trip content was very good however our guide was not as informative as most we have worked with and he was heard to hear. Also the bus was very cold. We could have used more time at the war memorial museum (45 min. was not nearly enough). This was a very long drive for what we saw, but still it was interesting. My tour guide Tristen was excellent! This was a great tour. It was a very long day, but worth it. We happen to be at the War Memorial during a special ceremony which was amazing. I highly recommend this tour for anyone wanting to know how the Australian Government works.